From Waikīkī, drive mauka (toward the mountains) along Punahou Street. Turn left on Nehoa Street then turn right on Makiki Street. When the road forks, take the left onto Makiki Heights Drive and follow the road up the hill (about a mile). You will see our sign on the right, just before a hairpin turn. After the turn, the museum entrance is on your right. From Waikiki, take the #13 bus on Kuhio Avenue towards downtown. Get off at the Alapai Transit Center near downtown to transfer to the #15 bus to Makiki Heights Drive. Disembark at the bus stop fronting Spalding House. Parking is FREE in the Spalding House parking lot. Please do not park in the surrounding neighborhood. Please lock your vehicle and do not leave valuables in sight. 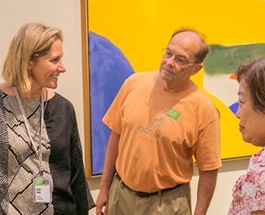 • See art in five main galleries, the Cades Pavillion, outdoor Surface Gallery, and in Spalding House Café. In the House: Recent Acquisitions is on view through Oct 29. • Sculpture-filled gardens overlooking Diamond Head and Honolulu. The collection includes works by such artists as Satoru Abe, Toshiko Takaezu, Deborah Butterfield and George Rickey. • David Hockney's L'Enfant et les sortilèges. Part of the Museum's permanent collection, housed in the Cades Pavilion. 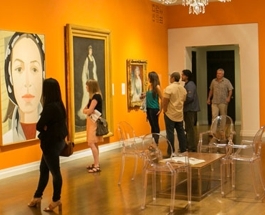 • Sit indoors in a gallery-like atmosphere amid changing displays of art, or outdoors in a garden setting for coffee and lunch at the Spalding House Café. • See Boz Schurr: (Ísland to Island) Korpúlfsstaðir and The 23hr Sunset in the Surface Gallery. • Spalding House Family Lounge is a public space for family fun, featuring self-guided art activities, crafts, and films. Open during museum hours. • Spalding House's bright, airy shop transforms this spring to reflect the season and surrounding gardens. Look for fun, eclectic items for the garden enthusiast and nature lover. • The free Spalding House Family Day takes place on the third Sunday of each month.